I first became aware of this author, book, and series through an article in Mystery Scene magazine, and then borrowed the book from the library. The Grantchester Mysteries is a series of books by British author James Runcie, set during the 1950s in Grantchester, a village near Cambridge in England. The books feature the clergyman-detective Canon Sidney Chambers. 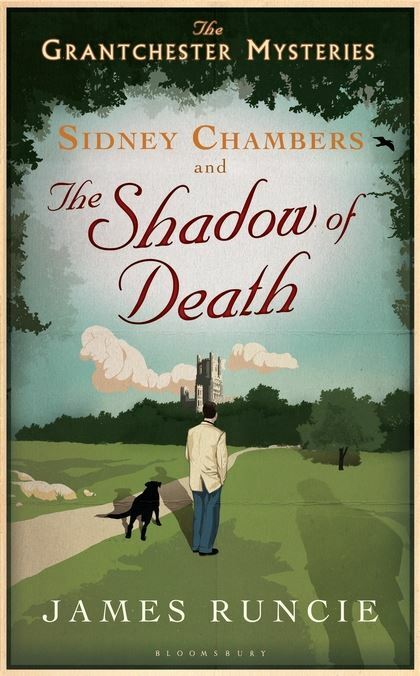 Sidney Chambers and the Shadow of Death, is comprised of six short standalone mysteries. This is a short story collection in all but name. The “stories” are just chapters, but each is a separate story. However there is no table of contents showing them and no separate title for each. The first chapter/story is about a suicide that has a close friend certain it must have been murder. The vicar, Canon Sidney Chambers, decides to poke about and uncovers some interesting discrepancies. The second story involves a missing engagement ring, one that disappeared during a New Years Eve celebration in the home of a popular MP. I enjoyed the book. The character is appealing, I liked the reference to jazz, an important element in one of the stories, and the portrayl of village life. Though it’s a bit lighter than my usual fare, this went quickly and was a nice diversion. The books were turned in the ITV detective drama Grantchester in the same time and setting as the books. They feature Anglican vicar Sidney Chambers (James Norton), who develops a sideline in sleuthing with the help of Detective Inspector Geordie Keating (Robson Green). The first series was based on the six stories from the first book, Sidney Chambers and the Shadow of Death. A second series was commissioned in late 2014 and broadcast in March and April 2016 and a third series is airing in 2017. I’ve seen Season 1 and enjoyed it quite a bit. We’re watching Season 2 now. A total of six books are planned. The series was inspired by James Runcie’s father, the former Archbishop of Canterbury, Robert Runcie. note: Some of the foregoing information was found on Wikipedia. This entry was posted in Books & Reading, Mystery, Short Stories. Bookmark the permalink. I have been planning to read these stories. It sounds interesting. I want to see the TV series but I would like to read the book first. I don’t think it matters which order you do it, Tracy, you’ll probably enjoy it either way. I haven’t read any of the books yet but I greatly enjoy the television series and am looking forward to the third season. I understand Runcie is working on a prequel to the series which will cover Sidney chambers’ war years. With all the flashbacks in the TV series, that sounds pretty interesting. We didn’t like the TV series much and I have no interest in the books. I’ve mentioned before that though I do generally like period mysteries on PBS, I have not enjoyed several set in the ‘fifties, including GRANTCHESTER and the newest FATHER BROWN series. I guess it’s me. But we are all entitled to our own tastes and opinions, and it doesn’t take away from anyone else’s enjoyment. I liked the stories, but after seeing the TV series, I liked it even better. I think it’s very well cast. As you say, to each his own on things like this. I read the first three or so Sidney Chambers books and found them enjoyable if lightweight. I’ve never watched the series so maybe it’s time I did. For whatever reason I find that most modern day authors fail to catch the ‘rhythm’ of vintage settings – can’t quite put my finger on it. Maybe it’s the language. I don’t know. But I found that with these books as well as with some other authors recreating life once upon a time. Still, I liked Sidney and his wife and the stories make for good little mysteries. In this book, Sidney has yet to have a wife, as is also true of the first season of the TV series. I have a hard time thinking of the Fifties as “old timey” as that’s when I grew up. Sounds good. I’ll track down a copy. I thought the TV series a vast improvement on the books. I couldn’t finish the first book I picked up. Intensely disliked one of the stories I read which was not adapted for TV (so far). The mysteries are slight and in most cases rather obvious. The theological talk and discussions of morality get heavy handed at times. Our library, of course, has them all so I didn’t waste any money of buying the book. But I’m not interested at all in trying Runcie again. Fair enough. I probably won’t bother with the other books either, but we continue to enjoy the TV series.